From Wednesday 24 January 2018 until Thursday 31 October 2019: Enjoy 10 % off! 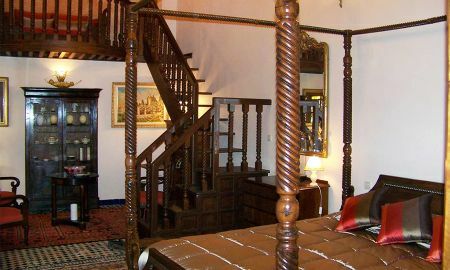 Ryad Salama is situated between the two main streets of medina Fes. 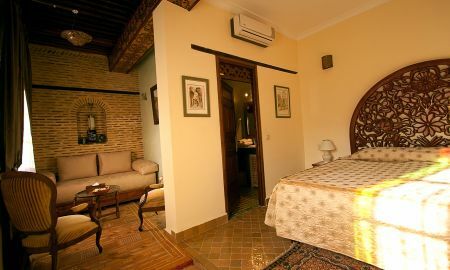 This riad is equipped with a swimming pool, 4 rooms and 3 suites furnished in a luxurious way, according to the traditional Moroccan style. All rooms and suites have a private balcony overlooking and offering a direct access to the garden. This accommodation is an ideal place to relax and rest. The staff of the Ryad is at your disposal to offer a high-quality service and meet your needs to let your stay be unforgettable. 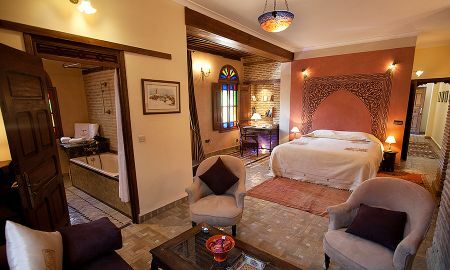 Location: The Ryad Salama is situated in the medina of Fès. Its ideal situation enables to access the main city attractions easily. The public parking area Ain Azliten is 5 minute walk from the Ryad. The Royal Golf of Fès and the Moulay Yacoub spa can be reached within 15 km.